A Few Favorite Things to Make Life More Enjoyable - Lovely Etc. Around this time every year, I start trying to figure out what to get for everyone on my Christmas shopping list. The kids are easy (mostly), but adults are much, much harder. And hardest of all is when people start asking me what is on my own list. I always love talking to others about their favorite things – those little treasures they have discovered that make their lives easier or just more enjoyable. And I have discovered some awesome gems to add to my own Christmas list as well as my list of gifts to buy for others. So this year I decided to share a short and sweet list of my own favorite things. I don’t typically talk much about things that aren’t DIY related here on the blog, but as I mentioned in my email newsletter last week, I want to change that a bit. I definitely will not stop sharing about my latest home upgrades and budget DIY projects, but I also want to be a bit more real and a bit more me around here. So in case you are struggling to figure out what to get your bestie (or yourself!) this year, these are a few of my favorite things that I recommend wholeheartedly. 1. The Cozy Minimalist Home. This book by The Nester just came out a few weeks ago and I have been hanging on every word as I read. Seriously, I wish I had been taking notes. I love to decorate and like to think I am somewhat good at it, but there have always been a few rooms in our home that just never feel right. I 100% believe this book is going to help me get them finally right. The book is all about striking that balance of having a stylish home without having a ton of stuff. So good. And not only that it is incredibly practical and walks you step by step through the entire process of putting a room together. 2. Sharpie Oil Based Paint Markers. These paint markers are a must for any DIYer and I try to keep black and white ones on hand at all times. The oil based paint writes well on wood, glass, and all kinds of other materials they make sign-making a snap. No more trying to paint letters with tiny paintbrushes. 3. One line a Day Five Year Journal. This is my second year using this 5 year journal and I am already so happy I have it. It is super simple. Each page has the date and room to write a few sentences about that day, each day for five years. I’m not disciplined enough to write in it every single day, but I write in it most days. Already, I love looking back to see what I wrote on this day last year. It is the perfect place to record my kids’ milestones and the funny things they say and you only write a few sentences a day so it isn’t a huge commitment. I also own and love this question a day version (and it’s gorgeous cover!) but the simplicity of the blank journal wins for me. 4. Garnier Fructis Nourishing Hair Mask + Coconut Extract. This year I have tried a ton of hair products. I’ve liked a lot of them, but this is one of my favorites. You can pick it up at any drugstore or Target for super cheap and it works as conditioner, a hair mask, or a leave in conditioner. And best of all, it smells wonderful and works beautifully when I am straightening my hair or wearing it wavy. 5. Dark Chocolate Peppermint Pretzel Crisps. These are so crazy delicious. I am absolutely incapable of not polishing off the whole bag in one sitting. I bought these on a whim a few years ago and now they are number one on my Christmas list every year. If you love chocolate and mint, you have to try them. And if you don’t love chocolate and mint, I don’t understand you at all! 6. Monster Superstar Blue Tooth Speaker. We have this Monster speaker and we use it all the time. It’s very compact, the sound quality is amazing, and it is super durable. We have used this as a bluetooth speaker in our cars many times and also use it at a home a lot to play music while we cook or clean. This would make an amazing gift for some of those hard to buy for people on your list. 7. Country Living Magazine. A few years ago I cancelled all of my magazine subscriptions. There is so much awesome content online, it seemed silly to subscribe to magazines which inevitably pile up and lead to more clutter that I just don’t need. But then I realized I missed magazines. I read tons of books and love to hold actual books in my hands – no e-readers for me. And magazines give a similar experience. Obviously I love DIY blogs and Pinterest, but cozying up on the couch with a magazine is just a whole different experience. And Country Living is by far my favorite magazine. I subscribe to a few other home magazines, but this is the one that just gets me and what I find inspiring. Want more gift giving inspiration? Just check out the links below. I’ d be happy to receive anything on this list! Especially the cozy minimalist home book! Thanks for the ideas! Me too Jess! And I think you would love the book – it is so good. Thank you Kathleen! I would definitely get the markers for your project! Thanks for the great ideas! 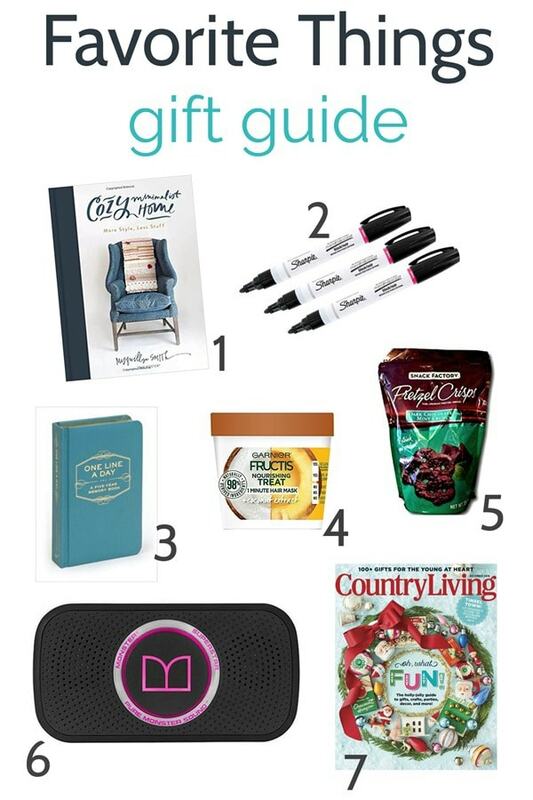 FYI, the link for the Chocolate Mint Pretzel Crisps takes you to an Amazon subscription for Country Living Magazine — OOPS! Whoops! Thanks for letting me know so I can fix it! Another great holiday list! I didn’t know The Nester had another book out. Love her blog, too. I’m going to have to try the 5 year journal. Might get one for my mom as it seems like a good gift for family elders too. Thanks Shelly! And I think you are right – the five year journal would be a great gift for seniors as well. I think I might just love all of those. Great ideas. I need this 5 year journal! I used to write to my kids every day. That turned into weekly, monthly, and now I barely find time to do it at all. The journal will get me back in the habit. And I love your list Carrie! Now I’ve got a few things I can say when people ask what’s on my wishlist this year! Thanks Melissa. The journal really does help. And even when I miss a few weeks, it’s still a lot better than not doing it at all!